Reel Whore: I Love It When a Movie Comes Together! This film was as sad as I thought it would be. This director is two for two for turds and to think he is the guy that brought us Narc. How the team met was idiotic. How a crazy person would be allowed back into the service is even more asinine. On what planet would that happen? Their trial made no sense. Where was their advocate? Where was Black Forest? How do they explain the Major’s Humvee blowing up and the container with cash blowing up? Absolute garbage. I’ll stick with The Rise of Cobra. Face in the sauna doing reverse crunches was funny though. very surprised to read this. I had no desire at all to watch and have read very little on it that has been positive. Glad to read this one.....may have to give it a second thought. @Film-book: I'll tell you where that happens, Planet A-Team! Just accept the plot's broadstrokes, don't over think it. It's not like the show was ever rocket science. Narc was a good movie, but I also dug the wackiness of Smokin Aces. Ia ssume you were calling that the turd, or did you mean Pride & Glory? Rise of Cobra?! You're killin' me! I enjoyed the absurdity of GI Joe more than I expected to, but A-Team would win out in a head-to-head for me. @Peter: Really? Seems like everyone I've talked to (film-book excluded) has liked it. A mindless, explosive popcorn flick. The film was daffy. COBRA-LALALALA!!! Shalrto Copley was awesome in it, but otherwise, eh. @Film-Book: I pity the fool who thinks GI Joe was better than A-Team! It's fun, crazy, and wild, perfect movie just for a fun watch. 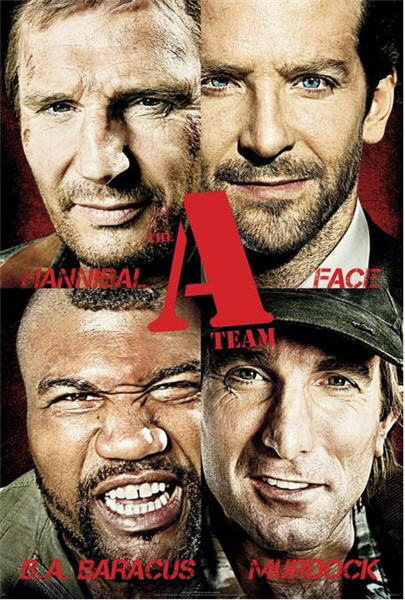 Check out my review here: http://dtmmr.wordpress.com/2010/07/15/the-a-team-2010/ Nice Review! Movies add chutzpah and glamour to our life. Without movies, our lives would be completely dull and drab. Movies simply combine moving images and sounds but they have become an essential ingredient of our lives. Movies showcase all the basic human emotions like pain, grief, happiness, joy and vengeance. Great movie of A team. Dialogues are the usual, the line 'I love it when a plan comes together' have been repeated sufficient times. Mostly I believe the action have been created on the computers but animation is realistic except barring some scenes in the end. The whole shipyard crumbling down was a bit too much.